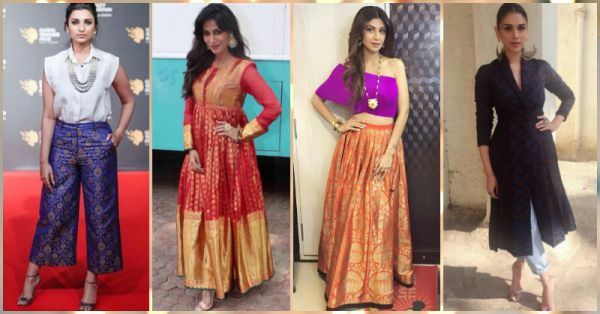 9 Amazing Shaadi Outfits You Can Create From Mom’s Silk Sarees! Your mom has an exquisite collection of sarees that you desire to wear one day! The sheen on the surface of these beautiful sarees that have been carefully stored dazzles you every single time. You look at them and wonder how you could do justice to those beautiful silk sarees that once adorned your mother and made her look like an ethereal princess. Here are some super interesting ways to reinvent and recreate those classics into something modern and chic! Source: Sanjana Batra On Instagram You can convert the longer part of the saree into a skirt - panelled, gathered or just a full round one depending on the pattern on the skirt. Match it with a crop top and add a border in case it doesn’t seem complete. You can give it the ethnic spin or a modish turn! 2. A Neat Summer Dress! Source: Mogra Designs On Instagram Take a plain silk saree with prominent border and create a dress with a simple silhouette as per you liking! It’s not just unique but it’s fusion at it’s best. You can even make a maxi dress with a temple border saree. It’s just going to look so different! 3. A Chic, Collared Trench Coat! Source: Sanam Ratansi On Instagram Yes, this is doable and so fancy! A cotton-silk blended saree with an interesting woven pattern will look delightful when turned into a trench coat. With a collar and a tie up waist and all that jazz. Just uber cool! 4. A Festive Long Kurta! Source: Gaurang Shah On Instagram ...Be it a blazing red and gold or a muted navy and silver. It’s the best alternative for someone who doesn’t like surface embellishments on their clothes. This concept exudes grandeur and lushness in the most obvious manner. 5. A Heavy Duty Dupatta! Source: Gaurang Shah On Instagram Just simply take the heaviest part of the saree and get it shortened to about 2.5 metres and match it with a simple, raw silk kurta. This elegant way of using the saree does justice to those nine yards with full heart. 6. A Smart Pair Of Brocade Pants! 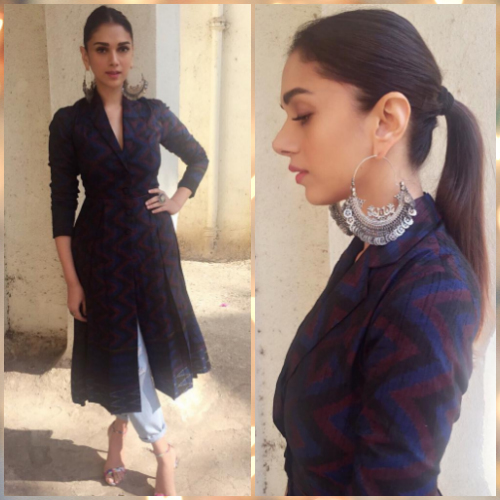 Source: Payal Khandwala On Instagram As the picture suggests, you can try a flared style, cigarette pants or a wide-legged ankle length one. They’ve got the contemporary vibe and will definitely catch you lots of compliments! 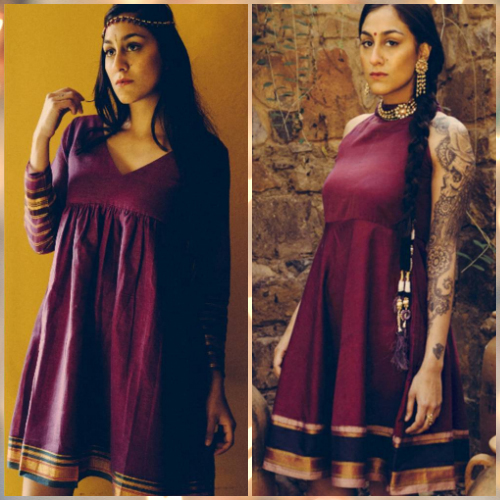 Match them with plain tops or even kurtis! 7. A Long Patchwork Cape! Source: Swati Vijaivargie On Instagram A long cape with layered cut outs from the saree can make any ordinary outfit look luxurious. The touch of shine on the surface will enhance the beauty of any simple outfit. You can add this dash of magic to upscale your staid clothes for a formal event! 8. An Indo-Western Three Piece Set! 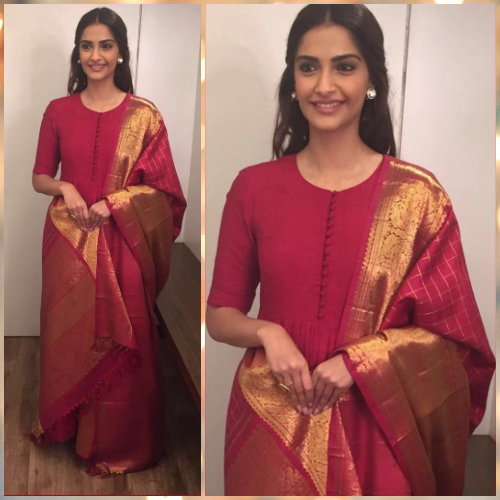 Source: Rhea Kapoor On Instagram Yes, you can make a full set out of your saree. Take the pallu part as the dupatta and the part where the pleats come in can be the skirt and you can match it with a plain raw silk crop top by combining it with a contrast or complimenting tinted silk fabric! Source: Payal Singhal On Instagram We’ve all seen silk blouses floating around.If you’re confident enough to carry off a brocade bandeau blouse with elan, take the saree that has an intense weaving on the pallu to create this style and match it with a plain, high-waisted skirt! You’re going to be on fire! HAVE A STORY IDEA FOR POPxo? If you want to hear about it, we can write about it! Just tell us your idea here! 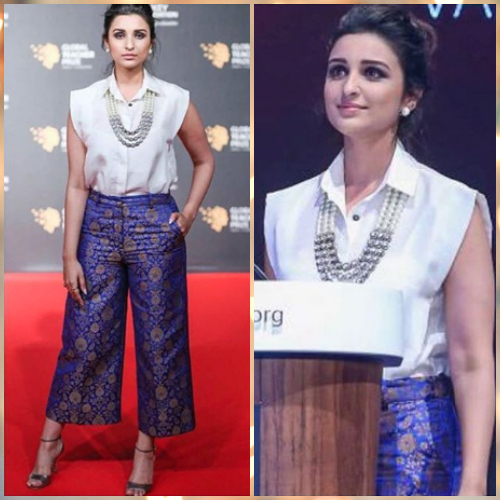 MUST-READ: 7 Ways To Use Your Saree Blouse To Make A Whole New Outfit! MUST-READ: 7 Ways To Style A Saree – Like Your Fav Bollywood Stars!